Even though Curtis Womack often sang lead, Bobby Womack was allowed to sing alongside him showcasing his gruff baritone vocals in contrast to his older brother’s smoother tenor. During performances, Bobby would sometimes imitate the role of a preacher. Sam Cooke discovered the group performing while he was still in the Soul Stirrers in 1956 and began mentoring the boys, promising them that he would help with their careers once he established himself. Within four years, Cooke had formed SAR Records and signed the quintet to the label. Bobby was sixteen. The group recorded two gospel sides before Cooke decided to have the boys switch over to pop music. Upon telling his father of the decision to go secular, an emotional Friendly Sr. told them that they had to leave the house. Cooke had the brother’s move to Los Angeles. 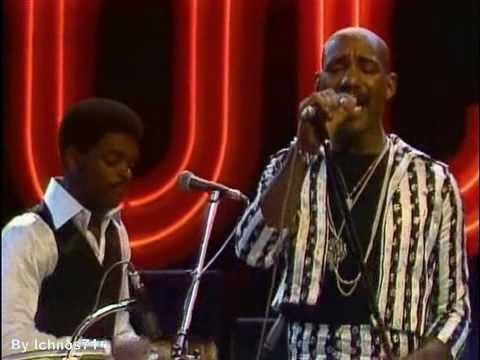 Changing their name to The Valentinos, Cooke produced and arranged the group’s first hit single, “Looking for a Love”, which was a pop version of a gospel song they had released titled “Couldn’t Hear Nobody Pray”, written by Bobby. The song became a R&B hit and helped land the group a spot on James Brown’s Revue. The group’s next hit came in 1964 with the country-tinged “It’s All Over Now”, co-composed by Bobby. Their version was rising on the charts when The Rolling Stones covered it. Bobby was initially angry until he saw his first royalty check for the single after it had become a hit. The Valentinos’ career was left shaky after Sam Cooke was shot and killed in a Los Angeles motel. Devastated by the news, the brothers disbanded and SAR Records folded. Bobby forged on a solo career, releasing sides for the Him and Checker labels without much success no thanks in part due to the controversy of his marriage to Cooke’s widow, Barbara Campbell. By 1966, Womack had settled on session work.